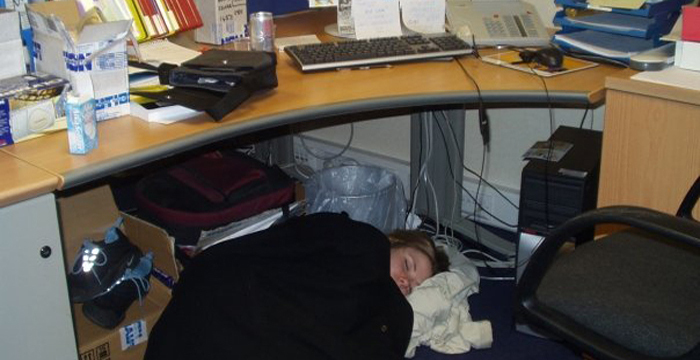 A top City law firm asked a group of its trainees to pull an all nighter just days after publically promising to support its lawyers’ mental wellbeing, Legal Cheek can reveal. The firm, which we have chosen not to name, then asked rookies who didn’t volunteer to “provide evidence” of their inability to help. In an email leaked to Legal Cheek (pictured below), an associate requested urgent support with a document review task for the firm’s Tokyo office. The message — fired off at 4:43pm last Friday (ouch!) — asks that trainees who “have [the] capacity to assist” to get in touch. Legal Cheek understands that the follow-up email was already being investigated internally before being leaked to us and that the partner in question has since been spoken to. As for the trainee volunteers, it is understood they were reviewing documents until 4:30am and were back up at 8am on Saturday to finish the job off. Wellbeing in the profession has become somewhat of a hot topic in recent years. Last year, research produced by the Junior Lawyers Division showed that the percentage of rookie solicitors who have experienced mental health problems had more than doubled over the past year. This came on the back of a number of highly-publicised Solicitors Disciplinary Tribunal cases in which solicitors cited mental health and stress-related issues. 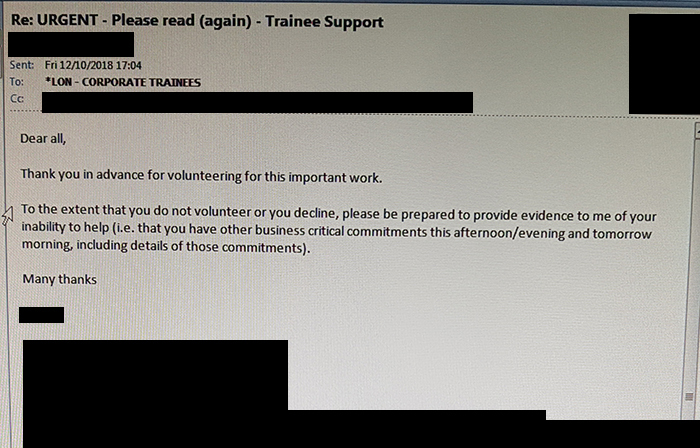 The post Exclusive: City law firm asks trainees to pull all nighter days after promising to support lawyers mental health appeared first on Legal Cheek.